My official return will be tomorrow, September 1st, but there are some things I can not hold off posting and this is one of them.... With the recent events in the south we are seing coverage of looting and their are cries of bias being heard from Black folk in how the media is covering the looting. We all know New Orleans has a high percentage of Black people and a great many of those Black folk are poor and were unable to leave as those with transportation (cars, trucks etc..)did. In light of that, the majority of those left behind were the poor and the poor tend to capatalize on any oppurtunity that arises that allows them to attain material items. The aftermath of the Hurricane Katrina is no different in this regard. People are looting, some of the things being taken are essentials and some are non-essentials. However the one thing that is consistant is the bias in the media in their coverage of the looters right down to the wording used for two people doing the very same thing. In the following news links you will find evidence of this. In the one with the Black child, his actions is refered to as looting while the one with the white folk is refered to as finding. The lines are almost identical except in one the word Looting is replaced with Finding. I few weeks ago my closest friend died. He was my dog, my boy and his profound wisdom mentored me, although we were almost the same age. One can only die if one did not produce the domino effect, which manifest most profoundly through the producing of offspring. However, another domino effect is the reverberations upon others from the impact of another’s life. I have committed myself to changes in my life born from the reverberations of the impact of my friend’s life and death upon my own life. This communication is not about my friend or me, however. This is about you…all of you. I have not looked at forums, blogs and message boards for nearly a month. Rather, I have been using my time more for research and gaining knowledge to which is leading to planning, preparation, prayer and hopefully, performance that will allow me and my family to survive the upcoming global economic crisis. I thought that when I returned that I would find commentary concerning this upcoming crisis, yet, it does not seem to be on the mind of many, if any. I really wish that most of you would change what you currently find worth your time and commentary and start exploring the hard realities of an impending economic depression. Forget all this democrat and republican, liberal conservative political misdirection and focus instead on economic fundamentals. Of course, people have been predicting that calamity is nigh for some time. However, there error was in predicting a date, not the fact that it is coming. The thing that many of you might want to note is that economics is a behavior science subject to the self fulfilling prophecy of human fears. If people or rather consumers think or fear that things are going bad or have hard evidence of it as fact, their consumption behavior will change or contract, which will self fulfill the prophecy. Consequently, it is very important to control the psychology of American consumers to keep them confident and to keep them consuming goods and services and not hunkering down, which will only exacerbate the condition if done is mass. Our government is lying to its people. The government tells you that inflation is running only about 2.5 to 3 percent over the last decade. There was even talk of the threat of “deflation”. However, in 1995, the methodology for the calculation of the Consumer Price Index (the CPI) changed. I won’t go into the fictitious and invalid rationalization for the new formula, but suffice in saying that it is invalid. Had the not instituted the new methodologies of hedonics and substitution, among others, and left the formula as was, the inflation rate would be averaging around 7 or 8 percent over the last decade. Why is this important? Well, for one thing, the government knows that entitlement programs, pensions and other fixed income instruments are in future jeopardy from the lack of revenues to fund them. These entitlements are adjusted each year in a Cost of Living Adjustment or COLA. COLA’s in theory are an attempt to maintain the purchasing power of entitlement monies, fixed incomes and other programs based upon the current value of the dollar effected by inflation. Thus, the CPI, the government calculation of the rate of inflation, is the benchmark for COLA adjustments. Hence, underreporting the rate of inflation through a bogus CPI actually reduces the government’s payments for entitlements. Not only that, if real inflation is running about 8% and your get a raise of 3 or 4 percent last year, your pay actually has decreased 4 or 5 percent. In other words, high rates of inflation, relative to stagnate or CPI level wage increases reduces ones standard of living via eroding the real purchasing power of their paychecks. Not only that, if you have money in savings, which few Americans do, based upon the personal savings rate data, the interest paid does not keep pace with real inflation, thus eroding the real value of your saved money. An erroneously low CPI index also overstates Gross Domestic Product (GDP). GDP is the primary statistic that most politicians, investors and economist focus the most on. As long a GDP is said to be growing at a healthy rate, our economy is said to be in good shape. However, GDP real growth is its growth rate relative to the rate of inflation growth and not absolute growth. For example, if inflation for the past year was 3% and GDP grew by 3% also, real GDP growth for the past year is zero. Moreover, if absolute GDP growth was 3% and the real rate of inflation was 8%, GDP growth is actually negative and two consecutive quarters of negative GDP growth meets the definition of an economy in recession. Folks…. In reality we have been in a recession since 2000. I think most people are aware also that unemployment figures are bogus. If not, the official unemployment rate ignores people who are severely unemployed to the point of discouragement. Such people have stopped looking because when they were looking, they could not find work. In recent years, this group of people has ballooned, but not being counted among the unemployed. Moreover, the phone survey, which constitutes the rate, went from a statistical sampling of 60,000 to 50,000 and much of the decreased sampling took place in inner cities where black concentration and unemployment rates are the highest. That having been said, one can only imagine what the true rate of black unemployment is in this nation, as well as our rate of poverty, which is formed from the same survey sampling. How many of you know that America is now the largest debtor nation in the world? What this nation owes to foreign central banks is well into the trillions of dollars. Much of that is born from running a 25 plus year trade deficit, which requires borrowing to make up the difference for our rate of consumption and investment that we cannot afford or fund ourselves. Look at what being debtor nations have done to the Third World. These nations spend more money servicing the interest payments on their debt than the do on schooling and infrastructure improvements. These nations are indentured to the IMF and the World Bank, which are simply controlled by the USA and Great Britain bankers. It now takes 4 dollars debt to create a one-dollar growth in GDP. Eventually the debt grows so large that we will have to borrow just keep up with interest payments. The United States became a debtor nation in 1973. The reason being is that the USA rise subsequent to that point was due to the destruction of the worlds major economies, except the USA, as a result of WWII. Everyone needed our money for loans to rebuild, much of which was used to buy goods and services from our nation whose infrastructure came out the war intact. There loss was our gain and translated to a virtually economic monopoly that increased our standard of living. However, as nations rebuilt and became more self sufficient, the monopoly was eroded by foreign competition. In 1973, our nation was on the gold standard. Foreign nations could sell their dollars back to the USA in exchange for Gold. When the USA economy started to go bad in the early seventies and inflation began to rise, foreign banks holding dollars wanted to trade them in for gold. In other words, they wanted the USA to pay their debts to these foreign banks in gold, which would have depleted our nations gold supply and readjusted our economy lower. Instead of letting this happen, Nixon took the nation off the gold standard by “floating” the dollar, which meant that the dollar was no longer based on a tangible asset. This meant that the foreign banks would have to be paid in dollars, which could now be printed at will, without the constraints to supply from gold reserves. The result of this is far too many dollars in circulation, which leads to easy credit, debt, inflation and eventually massive defaults when these debts cannot be paid. Now think of the recent change in law in regards to bankruptcy and what the nation’s banks have lobbied to protect accounts when the crisis hits. The Banking industry elites run the nation. Making matters worse is the seeming arrival of “Peak Oil”, which is the theoretical point where half the world’s oil reserves have been used up. At this point, supply cannot keep pace with growing demand and consequently the price rises to ration the remaining oil to the highest bidder. All modern economies are dependant on oil and if use of energy is reduced then a proportional reduction in the economy must follow suit as economic growth is dependant upon growth of energy consumption which fuels it. Even though the concept of peak oil logically valid and inevitable, no one really knows when it will manifest because no one really knows the true reserves of oil producing countries and companies, which often overstate reserves to build and or maintain investor confidence. What is known is that fewer and fewer new large discoveries have been found over the last decade. Without new reserves to replace tapped out old ones, the future for oil dependant economies is bleak. The problem with this nation is that its people suffer from a superiority complex. Far too many Americans are so confidence in this nation inherent superiority and its most favored nation status with God, that it cannot even introspect itself for improvement. Anyone who dares question the system is called a hater of America and point to all the other nations and people who supposedly have it worse. These are simply tactics to preserve the status quo, which up until the last decade, were simply the accrued benefits of the misfortune of others insecurity translating to our nations security. The people of this nation are not inherently superior in the eyes of God or in the eyes of humankind. The systems that we operate under also are not inherently superior either, as time will and is telling. The truth of the matter is that the concept of global “free markets” does not jive with a nation’s sovereignty and ability to control its own fate. By its very nature, freedom implies the lack of controls. Thus, as one gravitates more towards globally freer markets, one gravitate towards an uncontrollable fate. Entities in a global free market are all attempting to maximize the benefit to themselves, which can often be achieved by symbiotic relationships, but just as often, if not more, come at the expense of other entities in the market. Such is the nature of competition as in order for someone to win; someone must also lose unless competition results in a draw. The problem for America is that when the free market works against our interest, as it is doing now, we have not control over our economic fate and the decline of our standard of living. Right now we are borrowing our way to the maintenance of our living standards, which is not sustainable. The nation’s political elites, of both parties, will face a revolting populous if the promise of this nation is not fulfilled to its citizens. For those who want to stay in power, the only way to control the free market decline of America is via military action or threats. Other nations must be made to [fear] not acting in the interest of America. For example, oil is traded in US dollars, which has plummeted in value relative to currencies like the Euro. If oil producing nations decided to sell oil for Euros, which holds value better and thus is a better economic move for a country, it would be devastating for the US economy. Consequently, nations must be persuaded not to do this. Iraq did this and reaped big profits from this move, but it paid the consequence. In short, the global free market is nothing more than the freedom to act within the interest of the world’s only super power, lest you face its wrath. What I am about to say now is simply my personal opinion and not the result of economic research. I personally believe that our system is closer to evil than it is to righteousness. The reason that I say that is that our system is motivated and fueled by two of the 7 deadly sins, greed and gluttony. It is the greed motive that drives the entrepreneurial spirit and its is the desire for materialistic gluttony that fuels consumer spending which drives the whole vibrancy of the economy, which in turn creates the massive profits for entrepreneurs. Furthermore, the pillar of the whole system is Banking and their legal practice of usury. In all major religions, the practice of usury is condemned. Of course, if you look up the definition of usury, you will find a definition different from the traditional religious usage. Usury is simply profiting from the lending of money by virtue of interest charged. Think about it. If I have a surplus of money, some of which I will not need for a while and I lent that money to you, what would be my rationale for charging you interest? If I don’t need the money, it’s not costing my anything to let you have it, assuming that you will pay it back. If you need money and I have money in abundance, then my charging you interest is simply the exploitation of your need create profit for myself. The banking system, however, is even more underhanded than that. Banks actually lend out money that they don’t even have. It’s called “fractional banking”. The way it works is that there is a reserve requirement set for all Banks by the Federal Reserve Bank. The reserve requirement is the percent of loans that must be backed by actual savings deposits. The only money (true hard currency) that banks truly have to lend is the money of its depositors. However, a low reserve requirement, of say 10%, allows banks to lend out $100 dollars for every $10 dollars people have deposited in long term accounts in their banks. Thus, an astute person would ask” where does the $90 difference come from”? The answer to that question is “out of thin air” or electronic entries in accounts. That $90 dollar difference is the equivalent of counterfeit money. It is “credit money”, not real money. Yet, they expect to have the principle and interest paid back in real hard currency. What if you or I did that? What if we printed up some counterfeit dollars, lent them out, but demanded that we be repaid, with interest, in real dollars? Well, I could go on, but I think that should be enough, I hope to make people think about the future and not simply place their confidence that the people and institutions running this system and nation will ensure a bright future. Contrary to what some ideologies like to claim, individuals in an interdependent human construct do not have control over their fate. When things start to go bad, everyone will be affected to one degree or another negatively. However there are some things that you can do before things go bad that will help you better endure the crisis. The first thing you can do is to be ahead of the curves and trends. Before the masses realize that things are going bad, you need to realize it and start cutting back on your consumption and start accumulating money to invest in Gold or Silver. The reason I say gold or silver is that it is a protection against hyper inflation. Moreover, when the real estate bubble bursts, the stock market will fall and people will be looking for a safe place for their money, which will be precious metals. Consequently, the increased demand for precious metals will make the prices rise considerably. Hence, if you purchased Gold before the rush on Gold, the value of your investment may quadruple in a short time. Another thing you can do is invest in land where you can grow food and maybe raise livestock. If things decline to depression like conditions, or worse, you need the ability to go back to the basics for survival, like living off the land. If you own the land, you don’t have to indenture yourself to use the land and lend to your being exploited like many of our parents or grand parents who share cropped in the south. What we all need is a disaster recovery and survival plan. Plan, Prepare, Perform and last but not leas, Prayer. Remember Winston Churchill said: “The farther back you look, the farther ahead you can see”. There is nothing new under the sun in the human condition or behavior. The past is always prologue. PS The fate of America will mirror the fate General Motors. When the company was at its zenith, so was America. When it struggles, America struggles, w hen it declined, America declined. America, like GM, will have to downsize to survive and be competitive, but unlike GM, it does not have the type of leadership that does it, which will lead to economic calamity. The BBC has posted 10 things that they believe is not known about Slavery in Britain. I thought I would share it being that not all of us visit the BBC site. I would love to comment on each one but I just don’t have the time right now, as witnessed by my lack of posting but this too shall pass in a week or so. The story of British slavery is one of the greatest untold stories in UK history. It's a subject people don't talk about, with most Brits knowing more about slavery in the Deep South of the US. BBC Two's The Slavery Business is shedding some light on the truth behind Britain's slavery empire. Here are 10 things the series uncovers. 1. 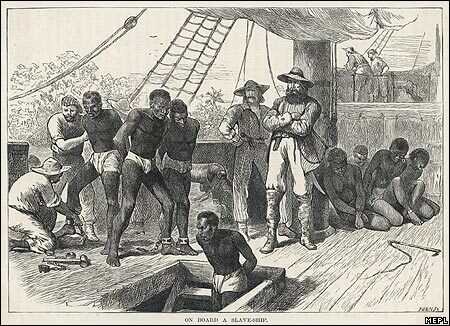 The British were the first big slave-trading nation to abandon the trade. They did this in 1807 when there were still huge profits to be made, and they did it for mainly moral reasons. It took a revolution of the slaves to destroy France's system and a terrible civil war in the US decided the fate of the slaves of the Southern States. In Britain alone slavery was ended by millions of people, black and white, free and enslaved, who decided it could no longer be tolerated. 2. From the ending of the slave trade to the beginning of the 20th Century, the Royal Navy patrolled off the coast of Africa searching for slave trading ships, boarding them and freeing the slaves. The fleet was known as the West Africa Squadrons. 3. Slaves in the British Caribbean didn't produce cotton as they did in the US. Sugar was the crop of islands like Jamaica and Barbados and the slaves who produced it were the world's first industrial workers. 4. The campaign to end slavery was dominated by women. With no vote, the anti-slavery crusade was one of the ways that women were able to get involved in politics. 5. Thousands of black slaves were brought to Britain by slave ships. In the 18th Century it was the height of fashion for rich ladies to have a black child servant. 6. Slave-produced sugar transformed our national cuisine. Much of what we today think of as the most traditional British food, is in fact only a couple of centuries old. Biscuits, cakes, sweets, toffee, rum and the resulting British sweet tooth - all products of that revolution in the kitchen brought about by sugar. Slave sugar was the missing ingredient that transformed tea from a strange novelty from India into an enduring national obsession. 7. Slavery was the world's first global industry but before globalism and corporations it was actually run by a few hundred families. Today many of the great aristocratic families of Britain have a hidden past in the slave trade. 8. Slavery in the British empire came to an end after a rebellion led by the Jamaican slave Sam Sharpe. Sharpe's original plan was to use non-violent passive resistance to end slavery. He was the Martin Luther King of the 19th Century. 9. The abolitionists were pioneers who helped invent the methods of political campaigning that we have today. They collected mass petitions, organised hundreds of local societies , created a campaign logo and even organised consumer boycotts.